On Chinese New Year’s Eve it is the ‘Family Reunion Dinner’. It is an important family tradition and every year on New Year’s Eve my family gets together for a big feast to celebrate the coming of the New Year. Last night we had dinner at the Northbridge Chinese Restaurant on Roe Street in Northbridge. There are a number of dishes that are always served in the banquet to symbolise good luck, health and prosperity. The banquet starts off with Yusheng, a Teochew-style raw fish salad. It consists of strips of raw fish (salmon), mixed with shredded vegetables and a variety of sauces and condiments. Eating this salad is said to bring good luck and success for the new year. Everyone has a hand in tossing the shredded ingredients into the air with their chopsticks while saying various "auspicious wishes" out loud. Lobster served with noodles as noodles represent longevity/long life. Vegetables which embody the freshness of "evergreen" with seafood (cuttlefish and scallops). A whole chicken which has been served chopped up. Note: you have to have a whole chicken not half as it symbolises family togetherness and wholeness. Eating fish to symbolise abundance and excess for the new year. For added symbolism, the fish is served whole, with head and tail attached, symbolizing a good beginning and ending for the coming year. Halfway through our meal dancing dragons come through the restaurant. The dragons go around to each table and diners give them a ‘lai see’ (a red envelop filled with money) as well as rubbing the head of the dragon for good luck. My dad giving a ‘lai see’ to a dragon across the table. The big feast happens on New Years Eve because on New Years Day it is a custom to begin the first day of the New Year eating vegetarian food. My mum tells me it's to cleanse our bodies and provide it with lots of nutrients. My Burmese friend told me that the Burmese have their own New Years celebration in mid-April and it is a custom on their New Years for people go around spraying water on each other. Water is symbolic for washing away past misdeeds to start the New Year physically and spiritually purified. When my mum was buying some food at the vegetarian market on James St, Northbridge the owner told her that eating vegetarian on New Years Day counteracts the effects of excessive eating of meat during the year. It is considered fortuitous for garnering good karma by refraining from eating anything that has been killed on New Years Day. The Chinese are superstitious and certain customs are followed for the Chinese New Year. A day before the New Year my mum gives the house a thorough cleaning to sweep away all the ill fortune/bad luck from the previous year and make way for the fortunes of the New Year. On New Years day we are not allowed to sweep the house as it is feared that good fortune for the New Year will be swept away. The other day I was telling my manager about this custom at work and she told me that her cleaner was coming around to clean her house that day and about 10 minutes later her cleaner had called and asked for the day off to celebrate the Chinese New Year. 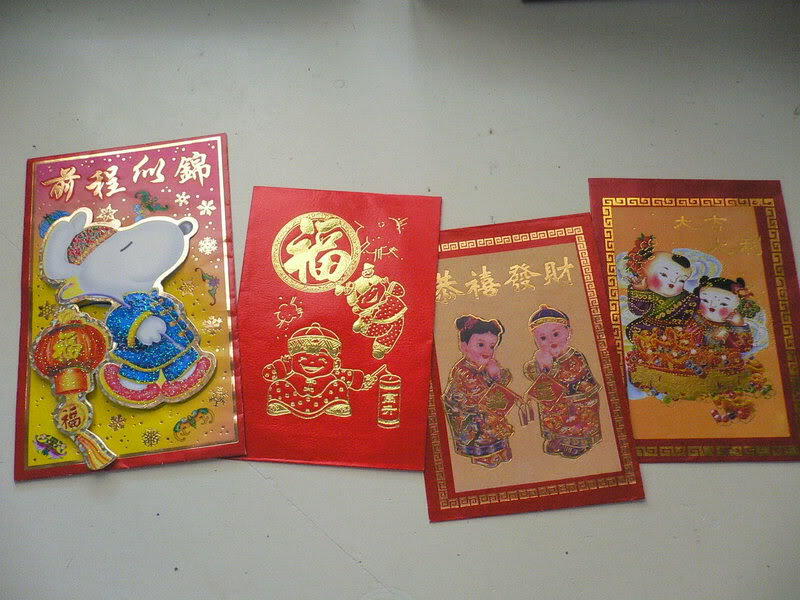 My favourite custom is the giving of money in special red envelopes “lai see”. 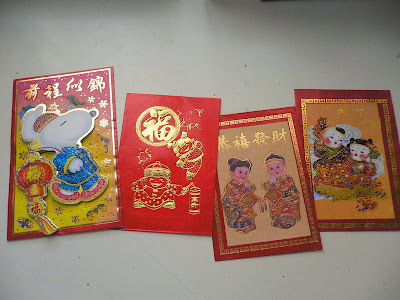 The amount of money given in a red envelope depends on how old you are and your relation to the person giving it to you. Money filled red envelopes are given out to children/unmarried individuals by parents, grandparents, relatives and close friends (so I will continue to receive lai see until I get married). Happy New Year - Gung Hei Fat Choy! Bring on the year of the rabbit.